The celebration of Mardi Gras has roots that stretch as far back as the 16th Century in Europe. These days, the biggest festival, or Carnival, is held in New Orleans every February. Travelers, revelers and people who just enjoy a good party converge on the city for a week of parades, music and some of the best feasts in the country. Even if you aren't able to fly to New Orleans, many people celebrate the tradition of Fat Tuesday - the English translation of Mardi Gras - by throwing theme parties at home. At Tutu Heaven, any excuse to dress up and have fun is just fine by us, and we're ready to help you get into the spirit with our fabulous collection of Mardi Gras masks. 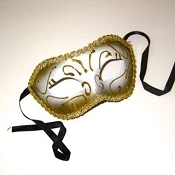 We carry both of the classic styles, the feathered mask in gold or silver, plus the white and gold eye mask made famous in France. Manufactured from top quality materials, these masks will last for years of good old-fashioned debauchery, no matter where your Mardi Gras party takes place. Order yours today, and never miss an opportunity to mask up and party down!